Little known fact: the phrase “going postal” was coined because of workplace violence attacks on post offices. The first major publicized workplace violence incident in an American post office happened on August 20, 1986. Patrick Sherrill, 44, of Edmond, Oklahoma, shot at two of his supervisors. He then went on to open fire in the facility. 14 people were killed, six were injured. The assailant later committed suicide. Possible motives vary from an unsatisfactory performance review the day before, to the fact that the assailant was a relief worker and didn’t have the job security of his peers. There have been several instances of post office workplace violence. Because workplace violence has unfortunately become a common event, the USPS Inspector General put out a publication on how to report workplace violence. In short, the publication recommends that victims of workplace violence call a number to report the event. There are several posters that the Inspector General recommends that each office display. There was a recent case of post office workplace violence that occurred on December 23, 2017, that still weighs heavy on everyone’s minds. DeShaune Stewart, 24, of Columbus Ohio, a postal worker, opened fire on his direct supervisor, killing him. The assailant also traveled to the postmaster’s apartment and threw her on the ground, causing blunt force trauma, killing her. Police believe that the assailant blamed the two victims for impending dismissal from his position at the post office. Be observant – employees should be vigilant for suspicious behavior. This includes customers and colleagues alike. Suspicious behavior can range from anywhere from worrying actions to specific threats. Report suspicious activity – along the same vein, this activity absolutely should be reported to a superior. If this is caught early, violence could potentially be avoided. Workplace violence awareness – make employees aware of workplace violence. Let them know what it entails and what to look out for. Awareness is an excellent tool to let everyone know what to be on the lookout for. Incident response plan – an incident response plan is essential should the worst happen. Even though employers hope never to implement the incident response plan, just knowing what to do in a crisis can help everyone handle the problem smoother. Security system – again, it seems obvious, but it is exponentially helpful. There have been times where violence was completely avoided due to the presence of a security system. A decent security system should have views of all areas of the workplace as well as a way to contact emergency services. Stay in touch – in the instance of a working environment where co-workers do not necessarily work closely together, contact is essential. Many employers issue cell phones or walkie-talkies so colleagues can get in touch with each other. Let the employer know if a domestic violence situation exists – many workplace violence acts against women were committed due to an existing domestic violence situation. Many times, a disgruntled ex-partner has entered the workplace and committed violence. The employer does not need to know everything, but they should potentially know if an ex-partner has a propensity for violence. Stay calm – this seems obvious, but it may not always happen in a heated situation. If nothing else, keeping calm will help everyone keep a clear head. Do not go anywhere unsafe – trust your gut. If it doesn’t seem safe, do not go alone. The buddy system is critical if entering the risky situation is unavoidable. Don’t be a hero – in case the worst happens, do not try to stop an assailant if it is not safe. First priority is getting out of the situation. Only fight with the attacker if there are no options left. 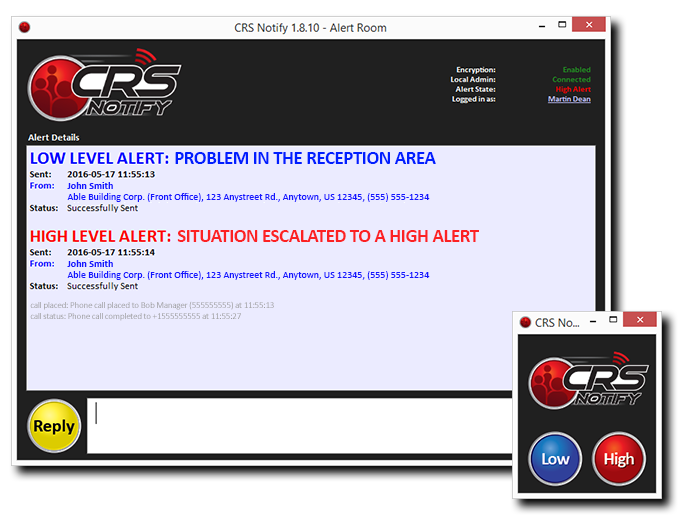 In the instance of having to contact emergency services, a panic button from CRS Notify is essential. The plan will be organized and accurate for a variety of possible emergencies. This plan will provide for the safety of all patrons and stakeholders. 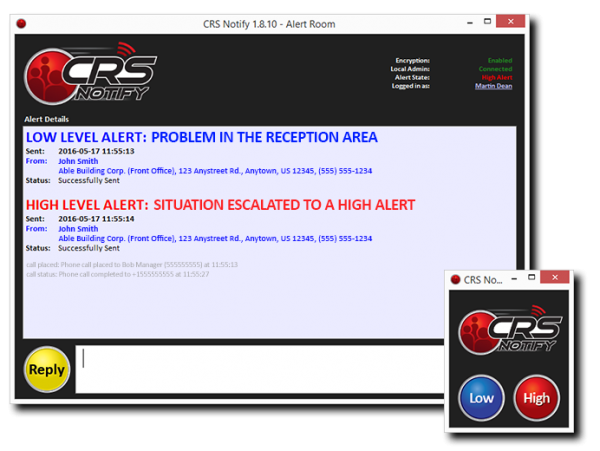 This program will include the use of CRS Notify emergency alert system and the means of communication during an emergency. The program will also seek to decrease liability that may develop during a crisis. This program will focus on proactive measures, rather than reactive. 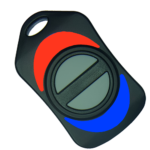 This program will help staff members, patrons, and other team members in identifying and responding to potential threats and emergency situations. In conclusion, an incident response plan is essential for a post office to run day-to-day operations. Because workplace violence can strike any place, any time, preparation is key. Don’t let workplace violence get the best of you and your workplace! Still Unsure About Workplace Violence in a Post Office? Contact us for more information to make the best decision for your post office.